Good morning! I hope you’ll pour yourself a cup of hot coffee or tea and enjoy today’s tour. 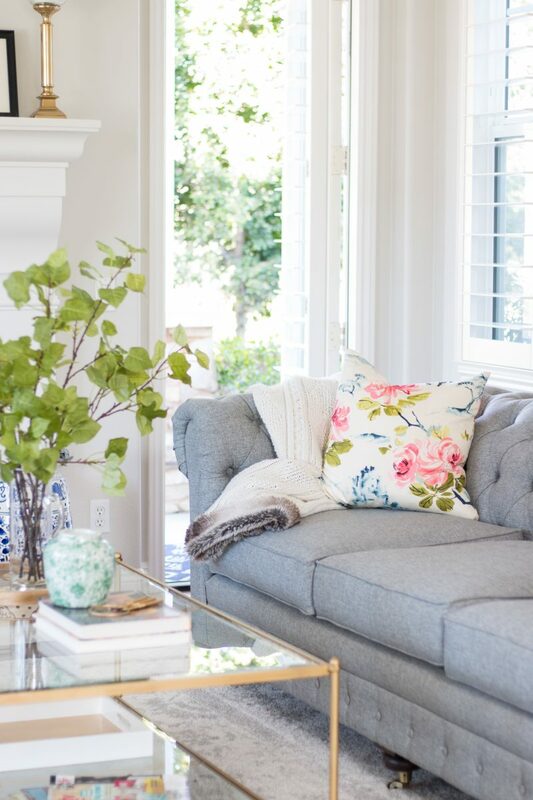 I am so excited to be joining Bree from Z Design at Home, our talented host, and all of the other bloggers who have beautiful Spring inspiration for you today. If you are visiting from Kelley Nan, welcome. Isn’t her home beautiful? 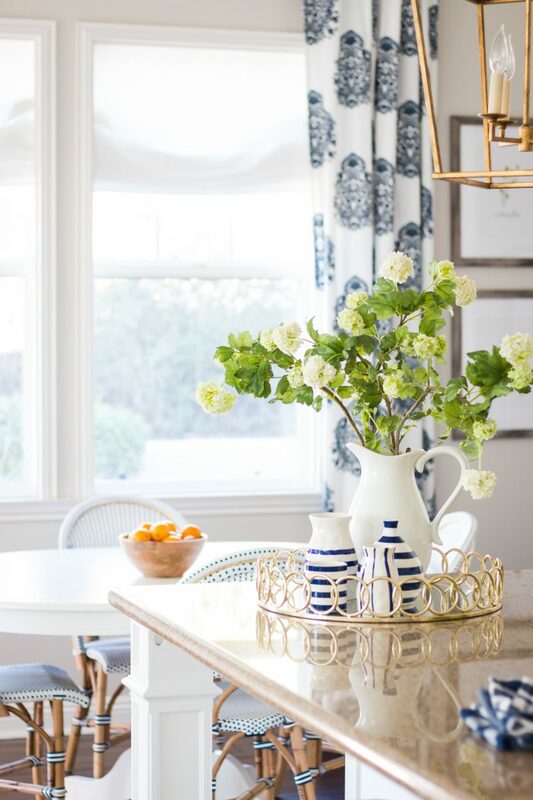 Spring is definitely in the air over here as we transition from the warm and cozy holiday decor to a light and bright palette. I like to keep things clean and simple around here. Let’s jump in. 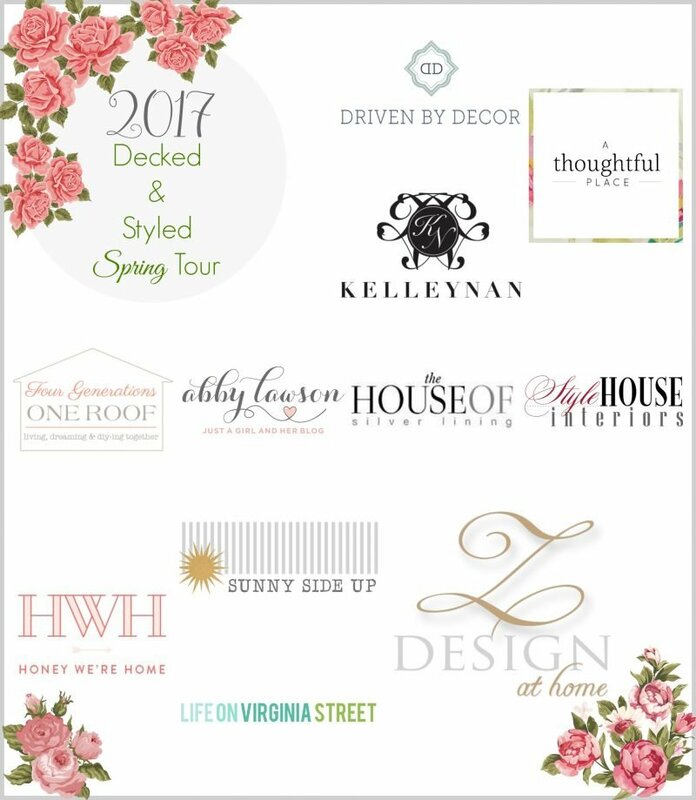 Here is my Decked + Styled Spring Tour. Here is our formal living room. We actually call it the library because there are built in bookcases on the wall opposite of the fireplace and it’s our family’s favorite spot to read. Quite a difference from the Decked + Styled Holiday Tour! The nice thing about this space is that it is flooded with natural light and we let the greenery outside take center stage. I had been eyeing these Tonic Living pillows for quite some time and I am thrilled with how they look in the space. I have to say that if you ever order from Tonic Living, always get the pillows with inserts. They are heavy and wonderful and far and away my favorite pillows in our home. The pillow fabric was specifically chosen to compliment this artwork. It’s a bold and fun statement piece and allows us to use really fun colors in the room. Our mantel boasts family wedding photos. I love seeing these on a daily basis. I am in this room every single day. Whether I am blogging from the sofa or reading in the evening, it’s one of my favorite spots. Spring or not, I still love a big chunky blanket to put over me in the evenings. 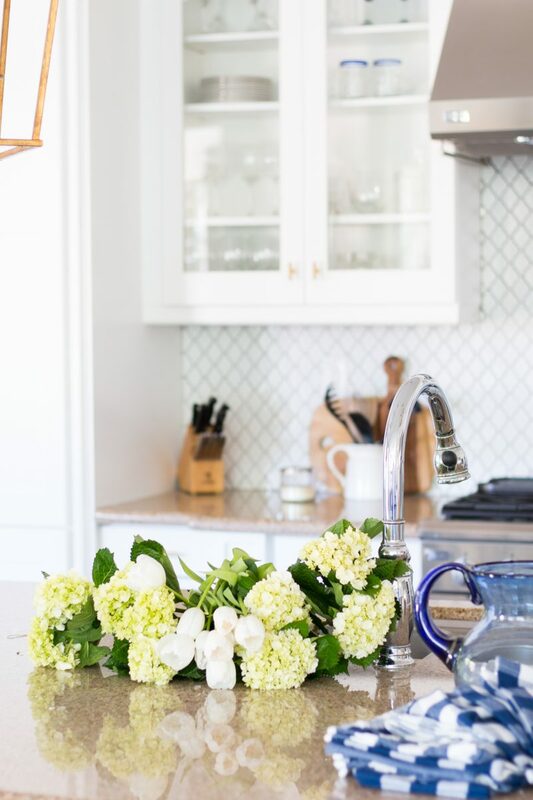 I am always in favor of mixing fresh flowers with faux. 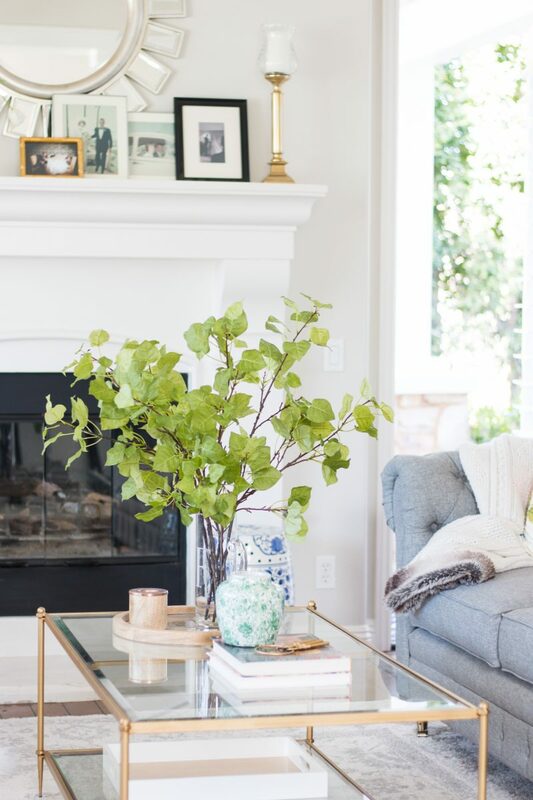 These stems add nice height to the coffee table and draw the outdoors in. 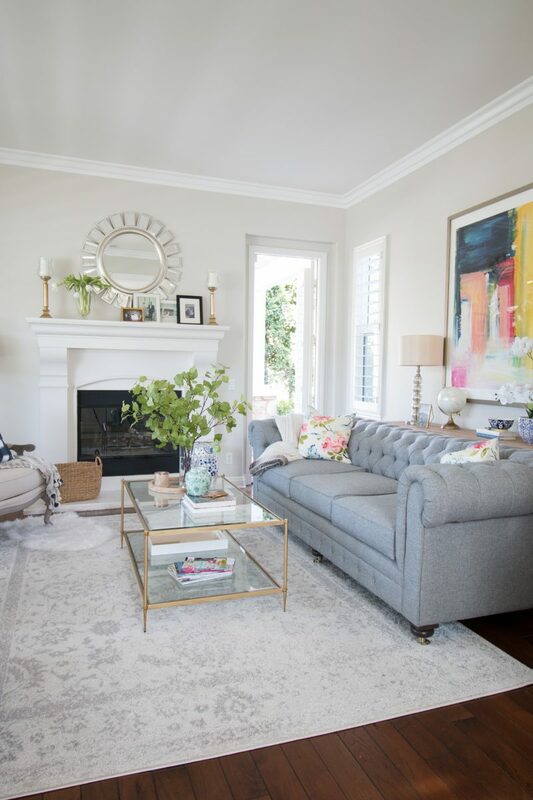 These buffalo checked pillows from Caitlin Wilson help balance out the floral ones on the sofa and draw out the blue in the artwork. We are still really loving our neutral rug. We keep these botanical prints up year round. I downloaded them from Etsy and had them printed at my local Staples. So easy and inexpensive. The frames were a HomeGoods find but I highly recommend Framebridge if you are not framing them yourself. We used command strips to hang these. They allow for a tighter fit to the wall. 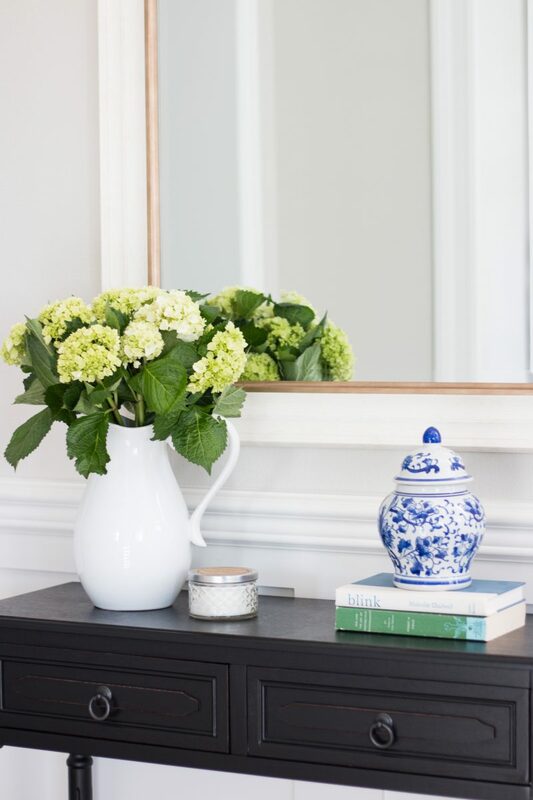 Our entryway console table is styled very simply with fresh flowers and green and blue accents. The mirror was a lucky find from HomeGoods. We purchased this pendant for our last home and it we are so happy it’s now in our foyer. It was a splurge but we have never regretted it. I kept the green and blue color scheme consistent throughout our home. I shared many of my Spring styling tips yesterday. 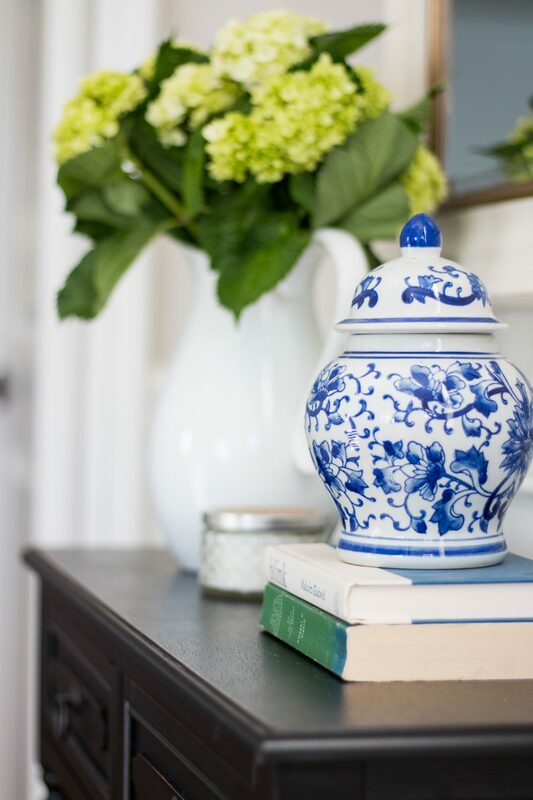 To see more of our blue and white decor you can go here. 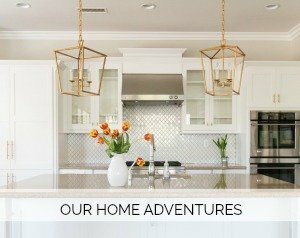 Also, if you are new to A Thoughtful Place, we recently made over our kitchen with a pretty dramatic before and after. Thank you for popping in and seeing how we freshen things up around here. I am now sending you off to the very talented Jen from Style House Interiors. Jen’s home is just so gorgeous. You’ll love what she has going on for this beautiful time of year. Beautiful Courtney. You do “simple” so well. 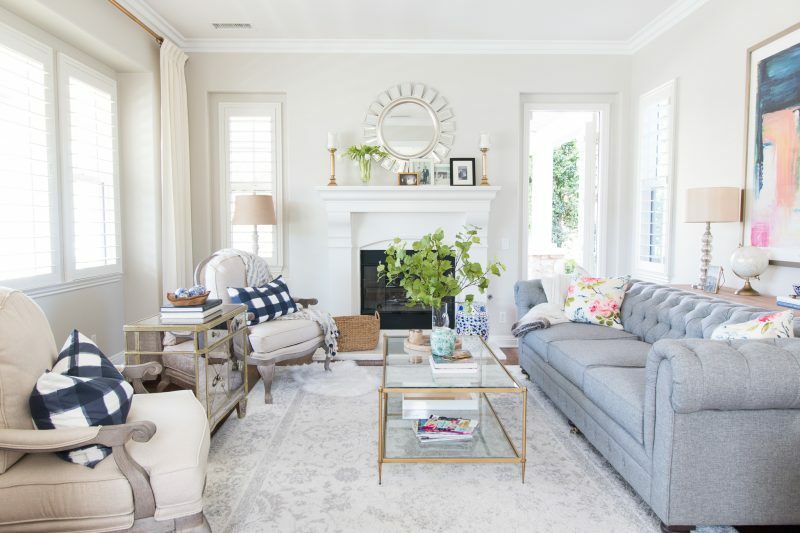 I am in agreement that you don’t have to “overdo” on home decor to create a beautiful space. Your home is so lovely Courtney. 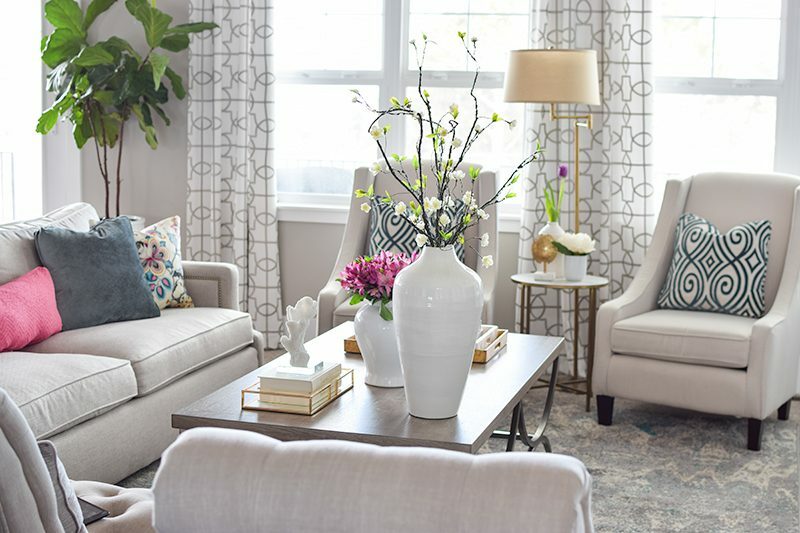 I love the neutral base and how you liven it up with accessories and florals. And I have to agree with you about the Tonic Living inserts – those are always the pillows I grab when I need to feel cozy on the sofa! Thank you so much, Jen. Such a nice compliment. And yes!!! Those inserts. I remember the first one I ever received was for our son’s room and I wanted to steal it. LOL. Have a great day, my friend. Just beautiful! 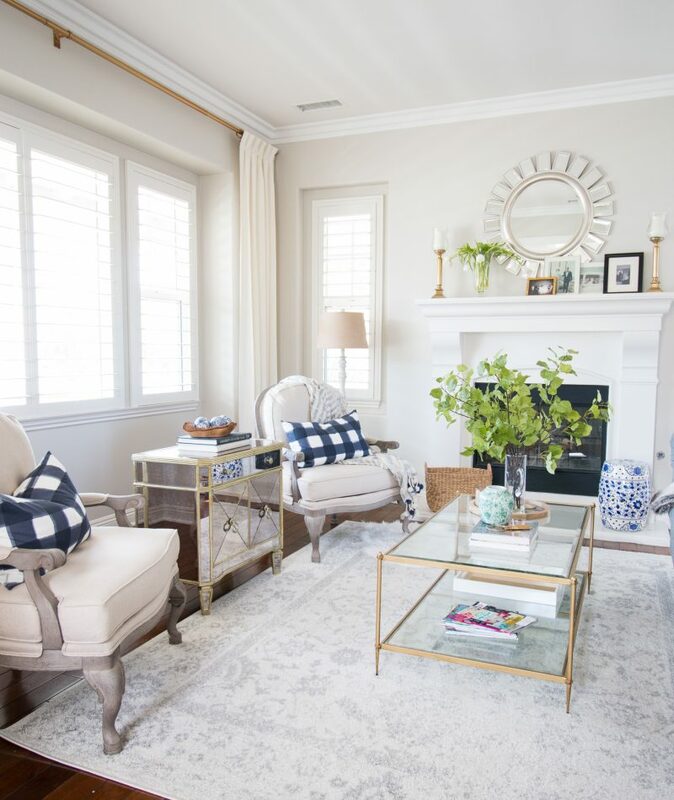 Would you mind sharing where your coffee table and the two linen chairs are from? They are exactly what I’m looking for. Thanks so much. Just found your site today. Love it! I can totally imagine myself plunked down on the sofa in your beautiful room – every detail is perfection! 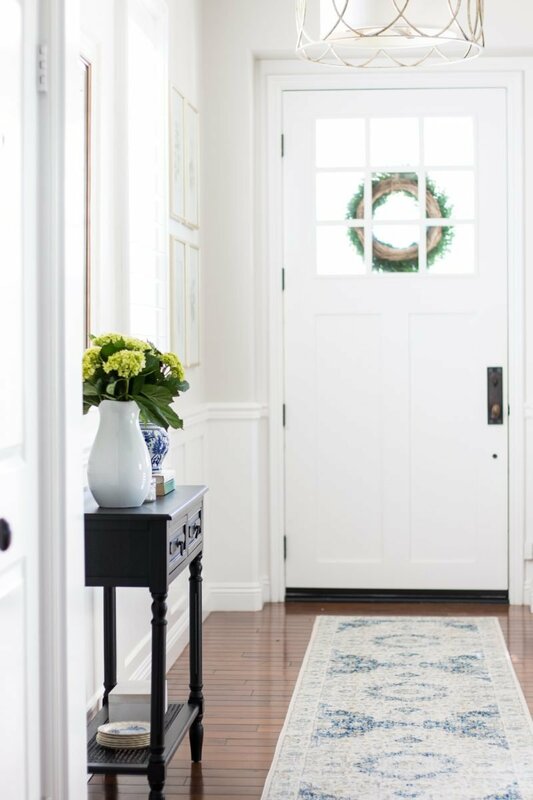 And I never noticed your foyer fixture before – love! Courtney, your new home is stunning! Do you mind me asking what size you ordered of the botanical prints in the foyer? Absolutely gorgeous, as always. 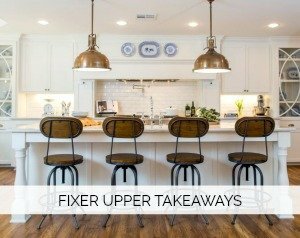 You are a master of simple, bright, meaningful decor and I wish you could decorate my home! 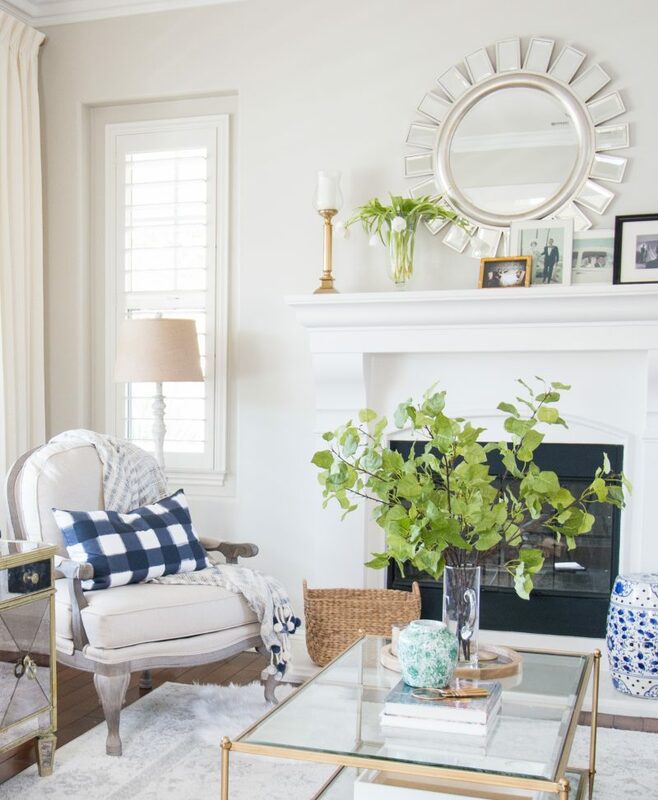 I’ve commented this before, but every time you decorate for a new season I show my husband the pictures because the style is what I’m going for. 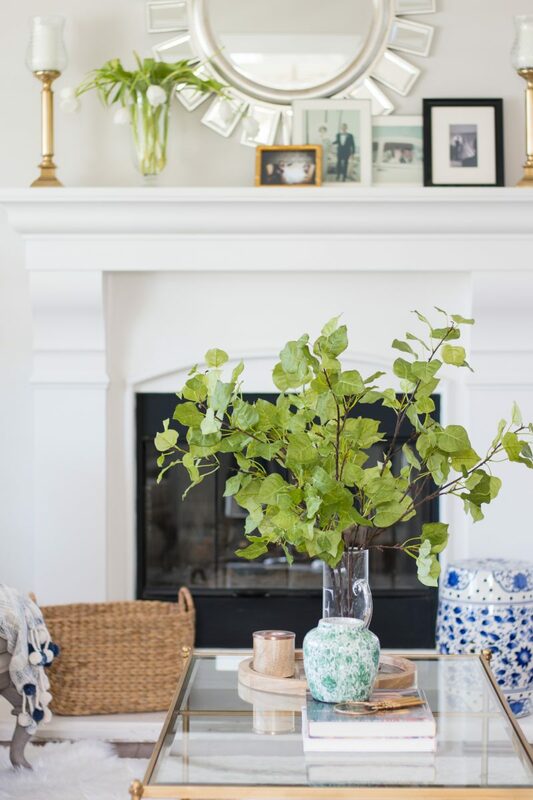 Love those vases from Michaels, as blue is my favorite color too and it pairs so well with that greenery. Enjoy your day, and your lovely home! So so pretty. It’s been nice to watch your house take on such a pretty personality. I bet your so thankful that you moved! I’d love for you to do a product review of some of your new house furnishings, especially the rugs- color and thickness. What paint colors did you use? I love them! Hi Melissa. It’s Pale Oak by Benjamin Moore on the walls and we think it’s White Shadow on the trim (we didn’t change the trim). Hope that helps. Hi Courtney! I came across your blog through liketoknowit and can’t get enough! My living room is very similar to yours and I’ve been looking for artwork above my grey sofa. 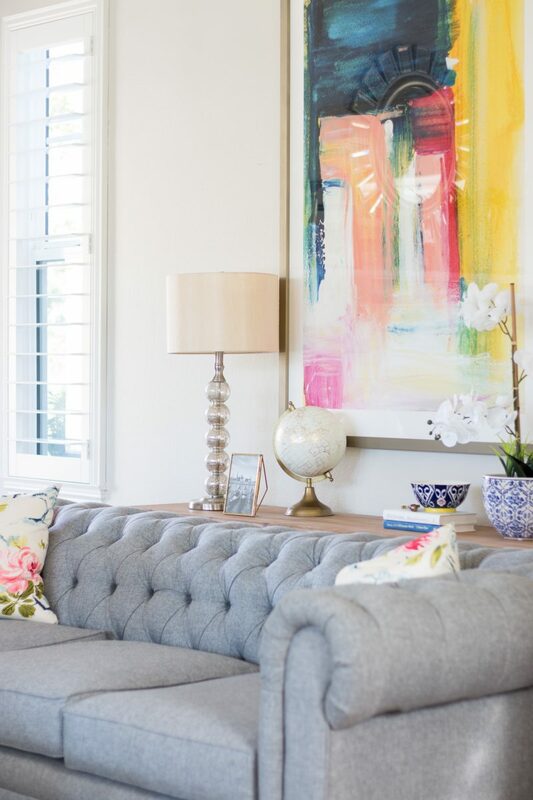 Do you mind sharing what size your painting is and the scale in relation to your couch and the wall it’s against? I keep thinking I need a horizontal print but yours looks so great I’m wondering if I can do vertical instead. Any insight would be appreciated!! Thanks in advance! Where are your white drapes and gold drapery rod from? They are from Tonic Living and the rod is from West Elm! Happy New Year! I just started following your blog and I must say LOVE! 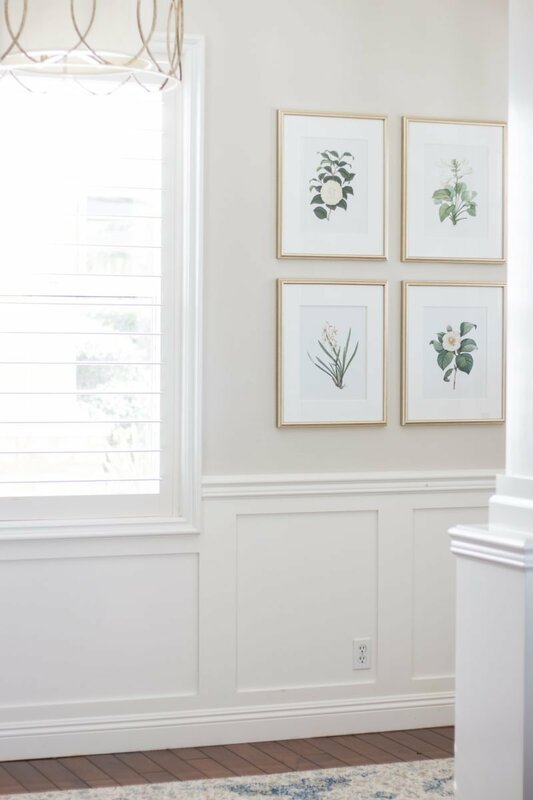 I purchased the same piece of artwork from Minted, can you share where you purchased the frame? My husband ripped the bottom trying to frame it himself (ugh!). I have the 40″X54″ piece.